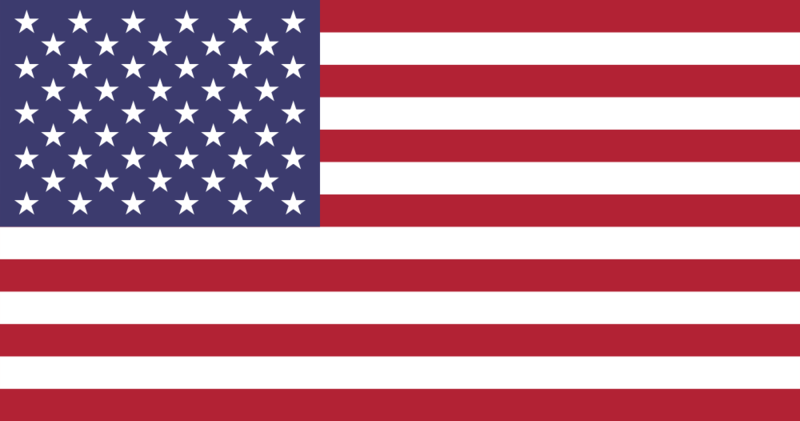 The current flag of the United States of America features thirteen horizontal stripes. The colors of the stripes alternate between red and white, with seven red stripes and six white stripes. These stripes represent the nation’s thirteen original colonies. These colonies, in the order in which they were settled, are Virginia, Massachusetts, New York, Maryland, Rhode Island, Connecticut, Delaware, New Hampshire, North Carolina, South Carolina, New Jersey, Pennsylvania and Georgia. The flag also has a blue left upper quadrant (or “canton”) that features white stars. The rows alternate between five stars and six stars, totaling 50. These stars represent the 50 current U.S. states. The current United States flag is actually the 27th version since the first flag was flown in 1776 at the time of the signing of the Declaration of Independence. The nation’s first flag was known as “the Continental Colors” or “the Grand Union flag.” It did not feature any stars, instead featuring a Union Jack in the canton of the flag. Following the Flag Resolution of 1777, the first flag was designed by Francis Hopkinson, a man that was a naval flag designer. From 1777 through 1795, there were four different U.S. flag designs, each with 13 red and white stripes and 13 stars. The differences in these flags lied in how the stars were arranged in the canton, with some in lines, while others in a circular pattern. Between 1795 and 1818, there were two more flag designs, this time incorporating 15 stars. In 1819, a new flag was created with 20 stars, and this flag lasted just one year before another was created with 21 stars. In 1820, another flag was created with 23 stars. This trend continued until the flag that is used today boasting 50 stars for 50 states was introduced in 1960. It has been the longest flag in use in America’s history. Many people have heard the story that Betsy Ross sewed the first flag based on a sketch made by George Washington. However, there is no evidence that this actually occurred. The family of Ross also stated that in 1776, when the first flag was sewn, Ross had not made a flag. There has also been some conflict as to who actually made the first flag. The family of a woman by the name of Rebecca Young claims that she was the seamstress of the first flag. There is no evidence to corroborate this story, and many give credit of the creation of the first flag to Francis Hopkinson, as mentioned earlier. The American flag has multiple nicknames, including “Old Glory,” “Stars and Stripes,” and “Star-Spangled Banner,” the name of the U.S. national anthem. The United States has a Flag Code that outlines different guidelines and rules for using, displaying and disposing of flags. Some of the most commonly known rules include not allowing the flag to ever touch the ground, required illumination if the flag flies at night, and proper destruction of a tattered flag, which typically means burning it. There are even rules that outline how it should be displayed on military uniforms and on vehicles. Military custom outlines that the U.S. flag should be folded in a triangular fashion. Thireen horizontal red and white stripes. 50 white stars on a blue background.